As one of the first Aikido dojos in China, Aikido Shinryukan Beijing was established in 2002. Aikido Doshu Moriteru Ueshiba and Toshiki Kaifu, then Prime Minister of Japan, both sent letters of congratulation on this event. Aikido Shinryukan Beijing is a branch of Aikido Shinryukan New Zealand; Chief Instructor is Nobuo Takase Shihan (7th Dan). Every year he comes to Beijing to give seminars and to take grading examinations. At present, Aikido Shinryukan Beijing has three branch dojos in Haidian District, in Tongzhou District, and also a Children’s class. 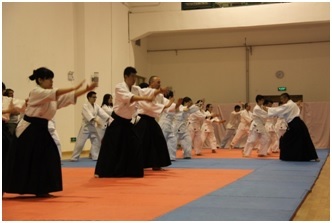 The Shuangyushu dojo was established in 2013 at Renmin University; its instructor is Mr. Stefan Sklenka. The dojo welcomes not only university students, but everybody interested in Aikido. At present, the dojo has members from different countries and of different age. Several students have already passed the first grading examination and received their 6th Kyu from Takase Shihan. Since its foundation, the Shuangyushu dojo has twice organized friendship seminars. Several of its members have also attended a seminar organized by Aikido Shinryukan Tianjin, the Hombu Dojo Seminar in Beijing 2014, and other activities. 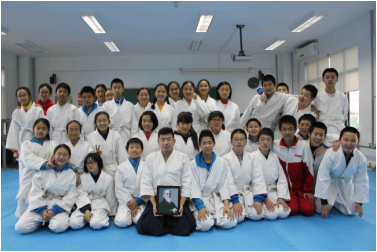 As the first Aikido dojo in Tongzhou District, the Tongzhou dojo was established in 2013 by Mr. Han Wenqi (3rd Dan) who is also its instructor. The training includes hand techniques as well as sword and staff training. Members of the Tongzhou dojo have attended the seminar with Takase Shihan in 2014, the Hombu Dojo seminar in Beijing 2014, and other activities with participants from different countries. Tongzhou dojo welcomes everybody who is interested in sport, especially in martial arts. Through the training, you can not only learn the art of self-defense, but also make new friends. The Children’s’ class was established in 2009, 5 years ago. During this time, children of all ages joined the class. Aikido is very suitable for children. Because the training requires no extraordinary physical strength, children of all age and with different physical conditions can learn the movements and techniques easily. By practicing Aikido, the children develop not only physical agility, motor coordination, speed of reaction and sense of balance, but also self-confidence and self-consciousness. We invite all parents to visit us and are happy to answer your questions. The Aikido Class at the Affiliated High School of Peking University was established in cooperation with Aikido Shinryukan Beijing. It is open for students of 1st and 2nd grade of junior middle school. The school offers a training room, whereas the instructors of Aikido Shinryukan Beijing, Han Wenqi and Stefan Sklenka, are responsible for the training. Students who decide to join the class will practice Aikido for the duration of two years. Training is twice per week. The training schedule was developed with special regard to the abilities and interests of the children. Examinations and a public performance for parents, school staff and fellow students are organized at the end of each term. At present, the Aikido class has about 40 students. It is the only Aikido class at a middle school in Beijing. The Renmin University Aikido Club was established in 2016. Its members are university students from all faculties. Training takes place three times per week; the instructor is Stefan Sklenka. The training gives university students, Middle School students and all other members of Shinryukan Beijing the opportunity to practice together and to learn from each other in an atmosphere of camaraderie and respect.